Joey Bosa and the San Diego Chargers' contract standoff is over, the franchise announced Monday afternoon. The New York Jets finally signed their first round pick, according to ESPN's Adam Schefter. Find out what NFL teams are saying about Ohio State's first round picks following the conclusion of league minicamps. The 2016 NFL Draft figures to be a coming out party for potentially the greatest class of Buckeyes ever. The Buffalo Bills' fourth-round pick, Cardale Jones, signed a four-year contract Tuesday projected to be worth $2.7 million. Braxton Miller is the newest Houston Texan. The former Ohio State wide receiver agreed to a four-year deal worth $3.11 million on Thursday. 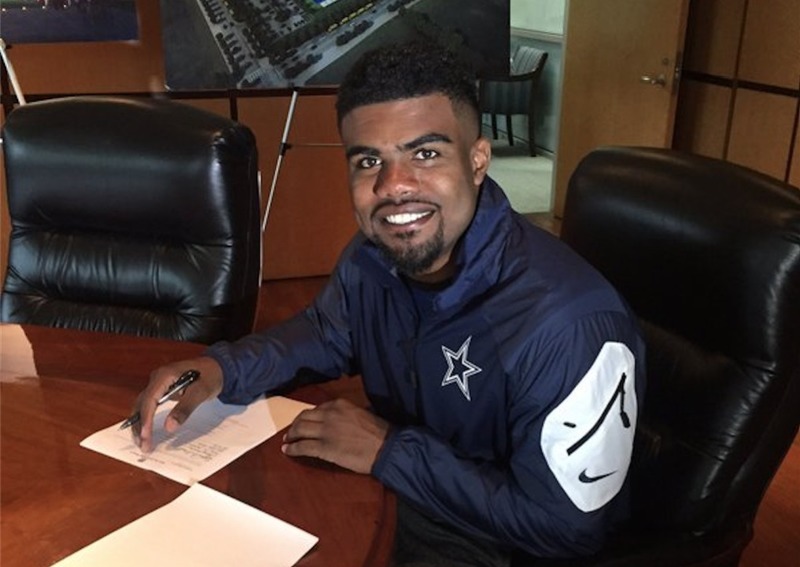 Ezekiel Elliott signed a four-year deal worth $24.9 million Wednesday to officially become a member of the Dallas Cowboys. Adolphus Washington, a third-round selection of the Buffalo Bills, signed his first professional contract on Monday. Details from Taylor Decker's first professional football contract were released Tuesday. The Detroit Lions guaranteed him nearly $11 million over four years. Eli Apple signed his rookie contract with the New York Giants Friday morning, the second Buckeye to ink his deal with his new team. Nick Vannett is projected to earn $3.1 million as a former third-round pick. A special NFL Draft edition of the Eleven Dubcast breaks down all of the Buckeye draft picks with our very own Tim Shoemaker, and answers listener questions in Ask Us Anything! A new wave of Buckeye talent has arrived to EA Sports' Madden franchise. Joey Bosa and Ezekiel Elliott are the highest rated Buckeye prospects at 84. Cardale Jones' reaction to being drafted by the Buffalo Bills was awesome. Ohio State safety Tyvis Powell signed a contract with the Seattle Seahawks as an undrafted free agent. Ohio State wide receiver Jalin Marshall signed with the New York Jets as an undrafted free agent. Ohio State offensive lineman Chase Farris is headed to Detroit as an undrafted free agent. Need a player at a certain position? Good chance Ohio State has one. At least one Buckeye has been taken from every positional group in the 2016 NFL Draft. The Buffalo Bills picked Cardale Jones 139th overall in the 2016 NFL Draft Saturday.